We see it every year. After New Year, there are many people getting back into the swing of things after a well earnt Christmas break, and our clinic is swamped with injuries. Whether this means getting back into normal exercise routines, preparing to start pre-season training, or even beginning a New Year’s resolution to exercise more, it is this period of the year that represents a significant risk of injury due to an often sharp increase in activity levels following the Christmas period. Below we will outline the number #1 key to preventing injuries in your body. To ensure that loads remain relatively consistent so your body is able to tolerate the exercise you are undertaking. To ensure that increases or decreases in activity levels occur at a gradual and reasonable rate so your body successfully adapts to these changes in load. To identify any significant spikes in activity levels (either an increase or decrease) that could significantly increase the risk of injury. Most people associate only an increase in load with an increased chance of injury, however, studies have shown that high load can actually be protective against injury due to the physiological benefits achieved through exercise, building resilience, robustness and fitness. On the flip side, doing less or “under-training” doesn’t necessarily reduce your injury risk as it can make you less resilient and conditioned and therefore more prone to injury. A common example is stress shielding that occurs in tendons.This is when a tendon is relatively under-trained, creating an environment whereby the outside of the tendon hardens and the inside of the tendon weakens. 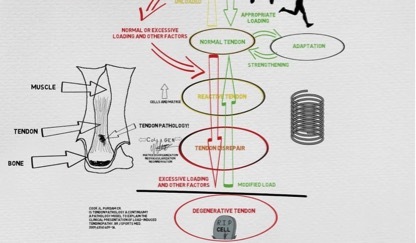 But getting the right load is hard, as seen in this very neat graphic by the tendon guru’s Cook and Purdam. The ideal load is one that maximises fitness and performance while also minimising injury risk. The key is not necessarily how much you do or the amount of load you undertake, but how you get there (i.e the rate at which this load is applied). Current research shows that excessive and rapid increases in the amount of exercise undertaken (whether that be an increase or decrease) will ultimately increase your risk of injury. The key is consistency in exercise load by avoiding large fluctuations in load, and gradual progression as desired. So how can you practically and easily implement load monitoring to reduce your own injury risk? The RPE training method (Rate of Perceived Exertion) is a very common method utilised in semi-elite and elite sport, can be used by anyone and has been shown to be a valid method for load monitoring in both individuals and team-based sports. It works by multiplying the duration of exercise (in minutes) by the intensity out of ten. For example, if you exercised for 60 minutes and rated this a 5/10 intensity, you would multiply 60 x 5 which equals 300. You would do this relatively simple calculation for each session you complete and then add up the scores for the week. You then monitor your total weekly score each week to monitor in an objective way whether your exercise loads have been relatively consistent or whether they have fluctuated. Research has shown that large week-to-week changes in load significantly increase injury risk. As a general rule, you want to be within 10% of your previous weekly score. The table below demonstrates how this may look – as you can see the third week indicates a significant increase in load. Another common approach to load monitoring is through the Acute:Chronic Workload Ratio (ACWR). This is a more complicated method to understand and may require further guidance from your Physiotherapist or exercise professional. The ACWR basically looks at your total load for the current week (acute) compared to your average load over the previous four weeks (chronic). The ideal ACWR to reduce injury risk is 0.8-1.2. Figures above this range would demonstrate an increase in your current/acute exercise load compared to your four-week/chronic load. Figures below this would demonstrate a decrease in your acute load compared to your chronic load. For example, if your current weekly score was 1000 and your four-week average was also 1000, your calculation would be 1000/1000 which equals one, which is right in the middle of the ideal range. If your current weekly score was 1000 and your four-week average was 500, your calculation would be 1000/500 which equals two, which is significantly higher than the ideal range. To put this into context, a score of more than 1.5 is thought to more than double your injury risk. 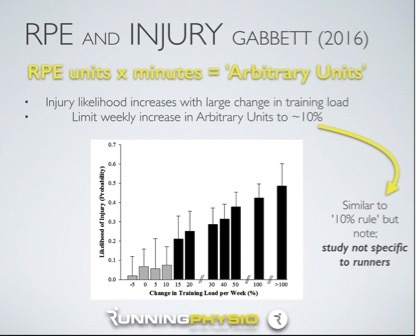 The RPE training method is not perfect however it is a practical way of giving you objective data on the load you are undertaking. There are also other ways you can monitor load, for example, the number of balls bowled or pitches thrown. 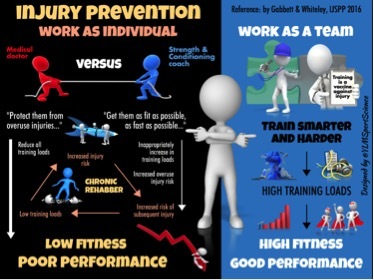 It is also important to consider that there are many other factors other than load that can influence your injury risk including age, previous injury, general health, fatigue, recovery and psychological factors such as motivation and stress. Load monitoring should, therefore, be individualised and this is something that can be discussed with your Physiotherapist. Effective load monitoring strategies have the potential to significantly reduce your injury risk, keeping you on track with your fitness goals or out on the park playing whatever sport you’re involved in. However, a team approach involving the coach, physio, S and C and yourself is the best protection. So if you are planning on doing that half marathon later in the year, or are just getting back into it after Easter, speak to us first. Let us help you design a program to stop the injuries in the first place. Leonora graduated from La Trobe University with a Bachelor of Physiotherapy in 2001. After working in the field of paedeatrics for 2 years, she decided to expand her scope of knowledge in health care and gained a Bachelor in Naturopathy from the Southern School of Natural Therapies. For a number of years, she combined both her work as a physiotherapist and naturopath in the fields of general practice, paediatrics and gerontology, during which time she gained much experience and an appreciation for the strong connection between physical, emotional and mental well-being. In most recent years she has dedicated her attention to geriatric physiotherapy, with a focus on functional wellness and independence.